We will have orders made and to the post office in 1-3 days from the date of purchase. Item discounted until February 6th. Simply let us know the two initials which we’ll be engraving. Would you like to add on a border to the puzzle? If you agree to share a picture of your puzzle on facebook.com/Havolydesigns or tagging us on instagram #Havolydesigns, we will include a free personalized magnet with your order. Win/Win! 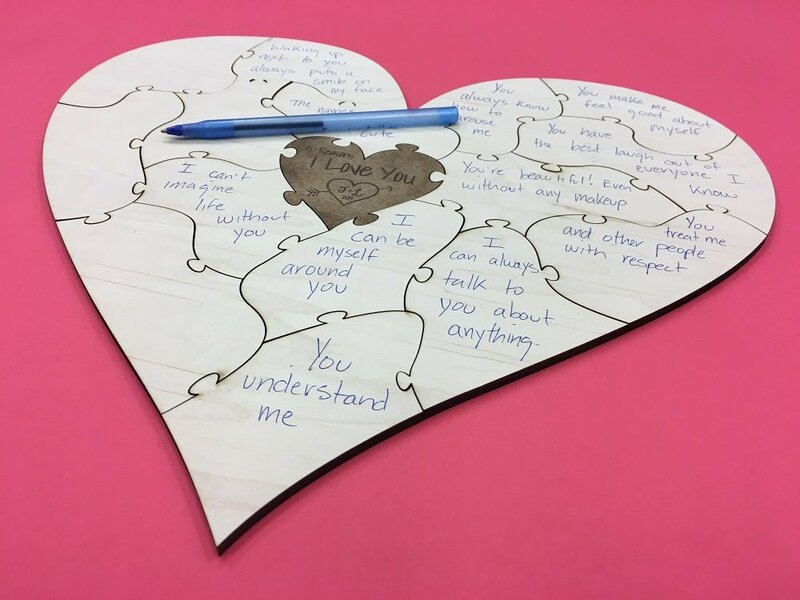 The 15 reasons why I love you puzzle is a thoughtful gift for a loved one this Valentine’s day. You write 15 things you love about them on the pieces, sit back and watch them ecstatically read them as they piece it together. Without a doubt, it will put them on cloud nine. It’s a touching and unique gift they’re sure to adore and cherish for a lifetime. 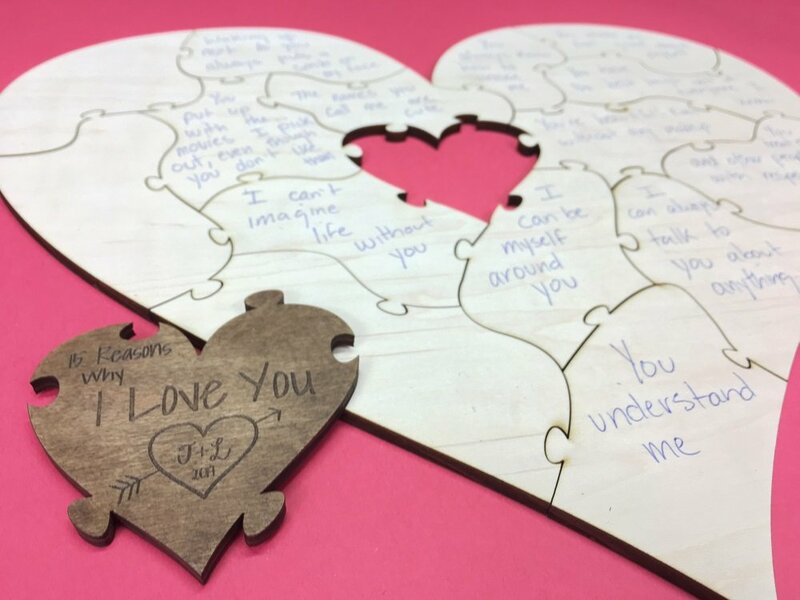 All of these puzzles come with a finished & personalized heart puzzle piece engraved with the initials you provide. These are good-sized puzzles! The full put together puzzle with no border is 13 1/2″ wide by 12″ tall. 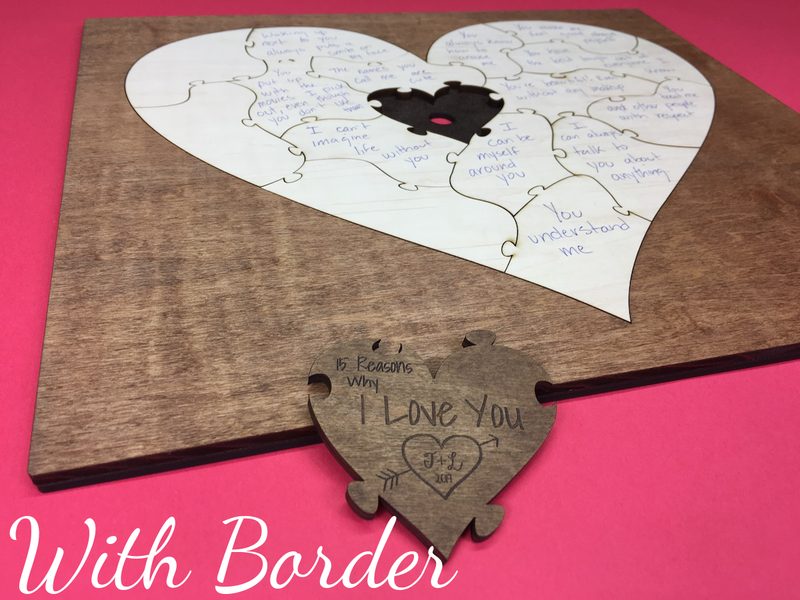 The border which surrounds the puzzle is 15 1/2″ x 13 3/4″. Each puzzle piece is unique and large. You can write a few sentences or just a few words on them. The border adds a great look to the puzzles. 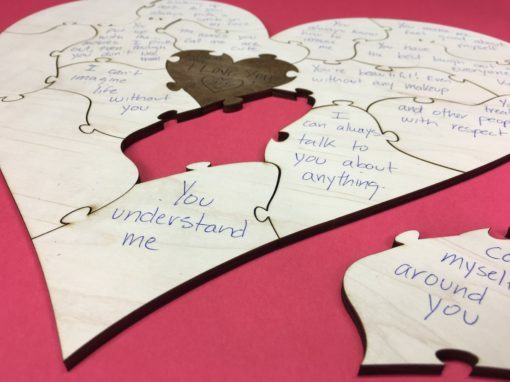 They are also cut from quarter-inch maple ply and coated with a dark brown finish to match the heart within the puzzle. The border, or frame, keeps the pieces securely in place. It also has padded hangers attached on the back, allowing the completed puzzle easily to be hung on the wall. First, you’ll need to secure the pieces in place so they don’t fall out. 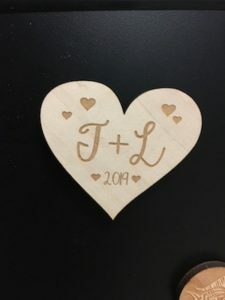 This can be done in a number of ways; we suggest glue dots or double-sided tape, or for a permanent bond, super glue, wood glue or a few coats of poly finish. 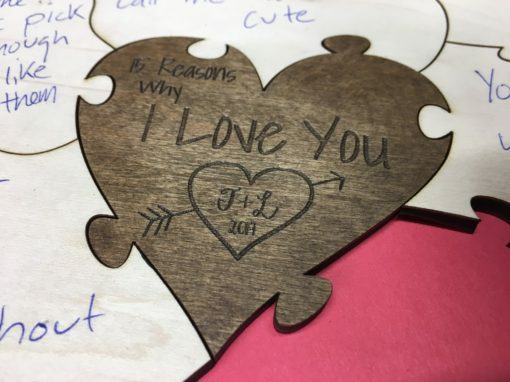 All of the puzzles are cut from quality quarter-inch maple plywood. Nearly any pen works for writing on them. Check out the video “What pen should I use for writing on wooden pieces?” – HERE. We suggest a regular bic pen, as this won’t bleed and allow a good amount of detail. Regular sharpies tend to bleed; however, we have not experienced any bleeding with an ultra fine-tip sharpie or sharpie pen. A couple of times in the past, people have told us these pens did bleed slightly,, although we have never experienced this directly. 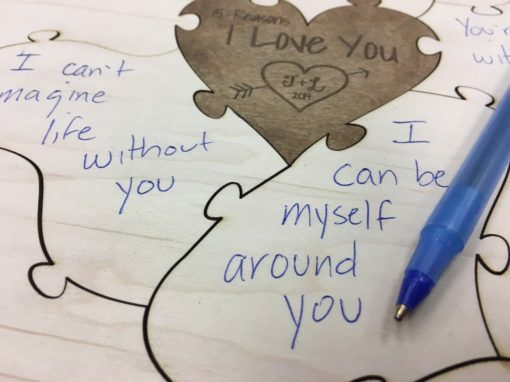 All wood is different, so test out different pens you may like before making a final selection. A blank piece of wood to test pens on is included with every order. 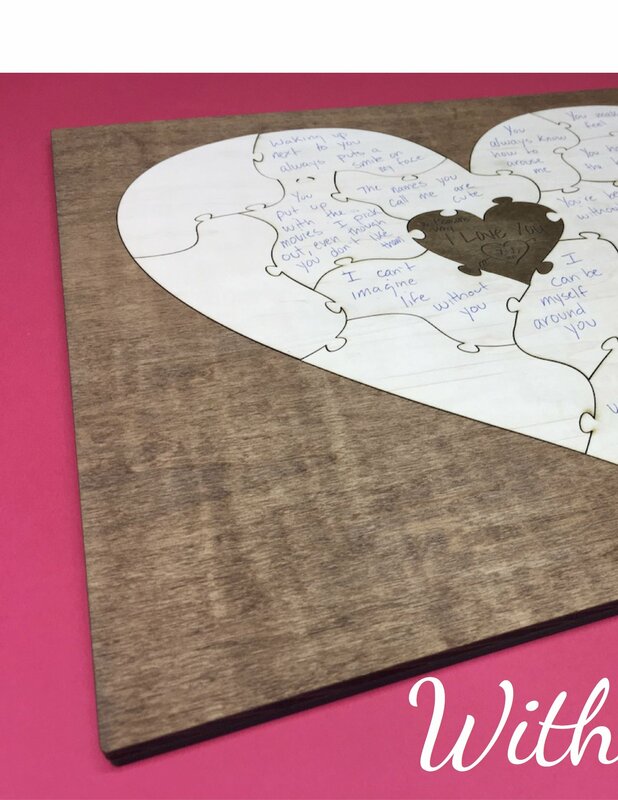 If you’re looking for a guest book alternative for a wedding or other event, check out the other puzzles we make. We have an elegant bordered look for tree puzzles, and also one for heart-shaped puzzles. All come in a variety of sizes. If you want something even bigger than what you find listed here on the website, shoot us a message. We do custom work all the time, so don’t hesitate to ask. Have an idea for a new puzzle shape? Drop us a message! We’re always trying to create new and exciting stuff. Awesome!! The quality of this puzzle is top notch. Thank you so much for going above and beyond. Can’t wait to give it to her.